The IP offices of Australia, Chile, Japan, Latvia, New Zealand, Singapore, Sweden, the United Kingdom and the United States provide exclusive updates into their current activities and priorities. 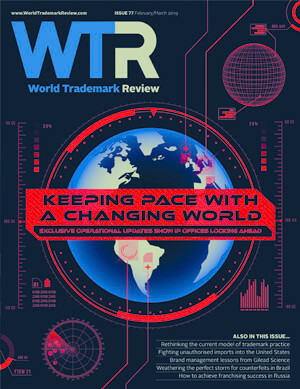 World Trademark Review takes an in-depth, data-led look into the retail sector, examines the growth of e-commerce, analyses how the top brands in retail have performed this past year, and much more. An analysis of Canadian trademark filings illustrates a sharp rise of applications in the cannabis sector; could that spike be replicated in the US in the future? WTR spoke to Gilead's Gretchen Stroud about the fight against fake drugs being sold on social media, the trademark challenges that arise when drugs go off-patent, and much more. WTR speaks with Monique Cheng Joe, head of brands and content at NBCUniversal, about the significant challenges of managing intellectual property for a global media and entertainment conglomerate. Trademark practices of the future will be very different to those of today. We take a look at what law firms can – and should – do to ensure that they stay ahead of the game. The grey market is a worldwide phenomenon. While trademark law offers remedies, there need to be material differences between grey-market and authorised goods – which is not always the case. The concept of data as a new form of IP right is being fiercely debated. However, it is certain that questions over ownership will not go away anytime soon. Recent jurisprudential trends show that courts are more and more willing to afford protection to fictional brands. However, there are several nuances of which to be aware. The economic recession has created conditions for a sharp increase in counterfeit products in Brazil’s physical and virtual marketplaces – making policing an urgent requirement for brands. Russia offers great potential for franchising, but local knowledge is key if brand owners are to avoid costly missteps. Requesting that the legal representative of a company bear joint and several liability for infringement can be a powerful enforcement tool – but is available only in specific circumstances. Following a record number of trademark applications, 2018 has been a busy year at IP Australia. Alongside core operations, the office has undertaken various initiatives this year – with more planned for 2019. The Chilean National Institute of Industrial Property reached the summit of its modernisation projects in 2018. Looking ahead, 2019 is likely to bring new challenges. It has been another busy year for the trademark division at the Japan Patent Office, especially in the development of examinations. Over the past year, creating a new legislative reality and increasing quality have been core focuses for the Latvian Patent Office. Already a leader in terms of online offerings, the IP Office of New Zealand is now seeking to maximise business IP awareness in order to allow companies to make the most of their intellectual property. The recent boom in economic activity across Asia has been reflected by a significant increase in the number of IP applications filed in the region – and the IP Office of Singapore is leading the way in innovation. Celebrating the 20th anniversary of the relocation of the design and trademark department, the Swedish Patent and Registration Office looks back on a busy year. While Brexit has been the primary focus of many practitioners in the United Kingdom, the UK Intellectual Property Office witnessed various other changes and developments in 2018. It has been another busy year for the USPTO, with major changes including enhanced stakeholder outreach and further action to tackle fraudulent solicitations. Artificial intelligence: a legal apocalypse or business ‘almost as usual’? In our latest column, we cut through concerns about how the development of AI technology could impact legal, and specifically trademark, practice. The increasing recognition of landlord liability provides brand owners with more effective means to fight counterfeit products. There are many Canadian trademark laws, regulations and statutes regarding selection, labelling and advertising in the food and recreational cannabis industries – all of which affect long-term branding rights and enforcement. Bad-faith filings are a major challenge in China; however, there are a number of tools available until further trademark regulation comes into force. The Trademarks Registry has made substantial progress to clear the backlog of opposition cases. Nevertheless, with fierce competition among emerging economies, there is more to be done. There is a need for change in Italy’s IP sector thanks to attempts to harmonise the national trademark regulations of EU member states and the global increase in technological innovation and online activity. The Madrid System can be used as a simple solution for registering trademarks worldwide. However, it does not guarantee that a trademark will be accepted in all designated countries. Three recent cases look set to shake up trademark practice in Russia and could well have an impact for years to come – especially when it comes to parallel imports and the territorial principles of trademark protection. For years the marijuana industry was an underground business, posing little threat to trademarks. But the recent ‘green explosion’ means that trademark owners must enforce their rights or risk their reputations.